We had a wonderful weekend getaway staying at this resort hotel we designed years ago – a much-needed rest from the pressures of work I didn’t even plug my internet cable to check my emails. (Advance Happy Valentines Day to you, too!) Just a teeny bit of work… design consultation yeah yeah yeah but that’s it. The rest is simply wonderful especially when everything is free. Haha! The hotel suite, the spa, the pool and oh the food! I just got shy I couldn’t bring myself to take photos but I can still remember the escargots! So much for that. Here’s my sinigang na manok (chicken in sour soup) using lemon (again!) as souring agent. 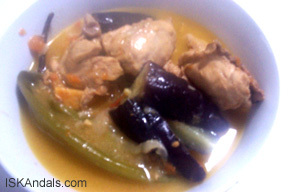 I admit I never thought chicken could be used for sinigang until I’ve read about it in the net. Karen and Connie, many thanks. Never did I see sinampalukang manok as sinigang, poor me. Anyhoo, it’s actually my first time to cook it this way – chicken, aubergine, taro sans the tamarind. Oh well, sinigang simply rocks! Heat few tbsps of oil in a pan. Fry garlic until aromatic. Add the chicken and saute for a minute. Season with patis and continue cooking and stirring for few minutes until the chicken colors slightly. Throw in the onions and tomatoes and saute until the tomatoes are crushed. Add about 5-6 cups of water (rice washing would be great), cover with a lid and simmer for about 15 to 20 minutes. Add the green chili pepper and gabi, (more water if necessary) and season with patis and half of the lemon juice. Continue cooking until the chicken is tender and the soup thickens with gabi (maybe cooked until mashed if desired). Adjust the taste if necessary, throw in the eggplant and stir in the remaining lemon juice. Simmer until eggplant slices are cooked. Serve hot with plain rice. Hi Iska, how are you? That makes the 2 of us… hehe. I didn’t know ‘sinigang manok’ either. I’ll have to try it some time with sampalok when it becomes available here. I cooked tinola the other night with green papaya.